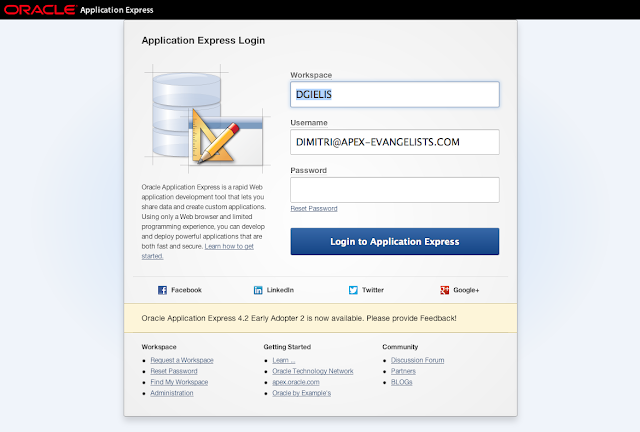 I met Chris Ostrowski at KScope 12 in San Antonio, he was actually in my session about the APEX Listener. During my presentation he recorded the entire presentation, not only my voice but also the screen. A few days ago he send me an email to say he put mine, and the other sessions he recorded, on YouTube. Update August 24th, 2012: the videos are (temporary?) unavailable. Arriving at the airport in Peru is different... immediately many people (taxi drivers) start to ask if you need a taxi, they even follow you, not really something I like. I stayed in the same hotel the conference was held, which was nice. Lima surprised me in many ways, I didn't expect to see so many US chains in Peru for example. The city has also many new buildings and it seems they are still doing a lot of constructions. A bit outside the big city there are really nice argeological sites. 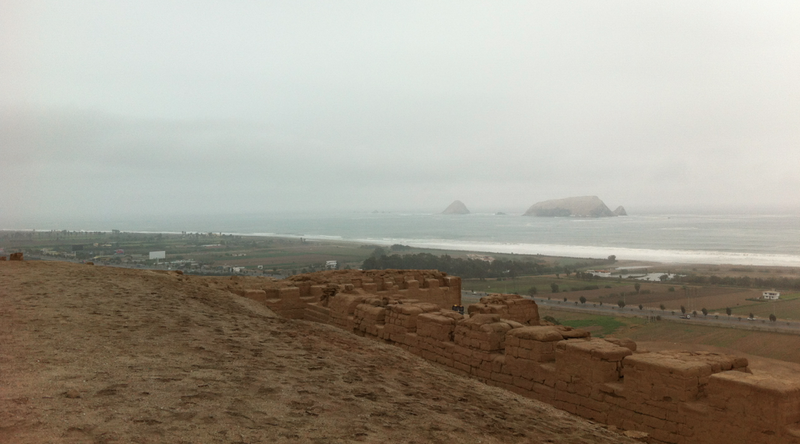 As I only had to be at the airport in the afternoon today, I made a stop at Pachacamac before noon. Oh and about the food, no meat anymore the last two days, seafood instead. There are some very nice places in Lima (Alfresco and Pescados Capitales). The conference itself had a really good turnout. About 170 people participated in it. The organizer told me APEX wasn't that known in Peru, that is why they asked me to do an APEX overview presentation. When I asked the people who had experience, only a few hands showed up, so what the organiser told me seemed to be true. The people were listening carefully, in the beginning maybe a bit skeptical as they didn't know what to expect, but the people became more and more enthusiast the more I talked and showed the power of APEX. During the presentation I didn't get that many questions but after it people couldn't stop asking. Even further on during the day people had more questions, talking to them makes me believe APEX will be more used in the future. I start to feel the follow-up of flying, a different environment every two days, meeting many new peoples, delivering presentations, checking in and out of hotels. So after the conference I just stayed in the hotel and tried to get some rest. Today I'm flying to Santiago, Chile. I'm actually trying to finish this blog post while I'm flying. It didn't take much or I didn't arrive in Chile until 5AM in the morning! I guess just like many airlines, LAN airlines who flies me from Lima to Santiago was overbooked and I was the unlucky one... and thinking that I arrived 3 hours before my flight in the airport! They offered me money and a place on the next flight which would leave Lima over midnight and arrive in Chile in the morning. I didn't like that idea for a second, I was tired and need to give three presentations tomorrow. Finally they told me to wait for 2 hours and see if somebody didn't show up. So I did, I waited and waited. One hour before the flight I got green light, I could check in after all, had to stand inline for border control and started my run to the gate once through... I made it. 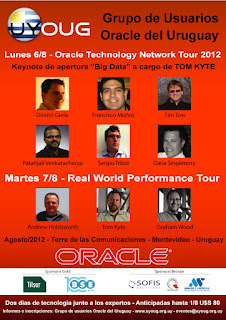 Tomorrow is the last stop of the LA OTN Tour in Santiago... the day after I will fly back home. Goodnight. 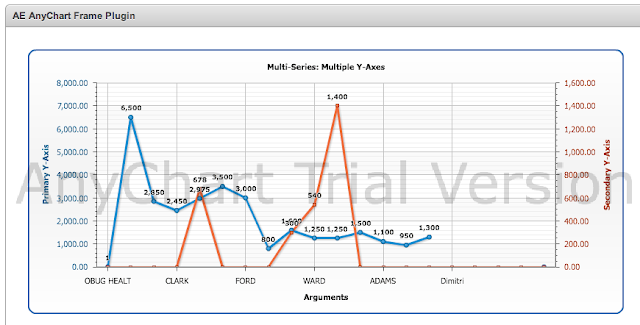 The reason is, there is a change in the files the AnyChart team gave to Oracle. Just to be clear, the above examples go further than what the APEX wizards give you, so it's not really something we can complain about. 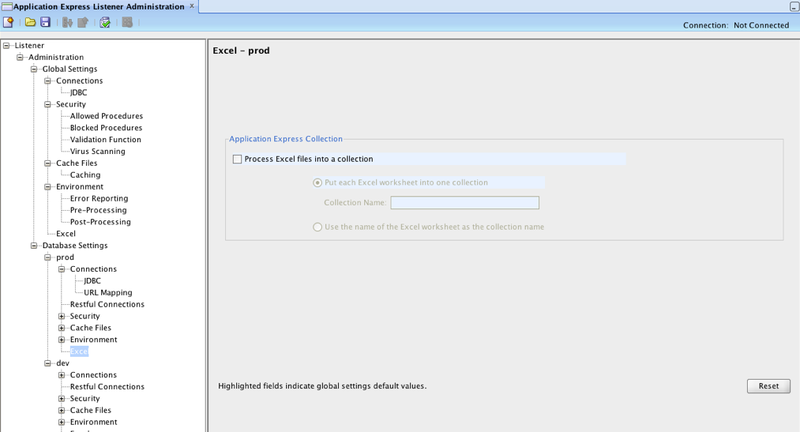 The issue is the OracleAnyChart.swf file and the AnyChart.swf file. They are different than the files supplied in APEX 4.0 (which the chapter was based on). With every new release of APEX, AnyChart provides the latest chart engine, but this time, next to update the engine, they limited the file in what it can do (which they didn't do before). 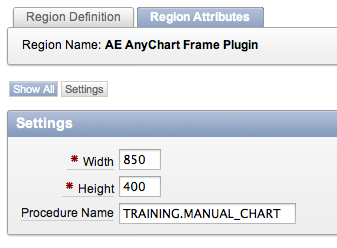 Oracle didn't license all the charts and the the full capabilities of the AnyChart engine so far. It remains to be seen which version we get with APEX 4.2. It should be AnyChart 6 with the support of HTML5 charts, so it might be that the other functionalities will work again too. Anyway as I started to get regular emails about it, I guess because more and more people are on APEX 4.1 now, I decided to blog about the different solutions you have to get my examples working. Just to be clear, the techniques I described to get most out of the charts in APEX are still valid, but for the three examples that didn't work anymore, you need to do an extra step. 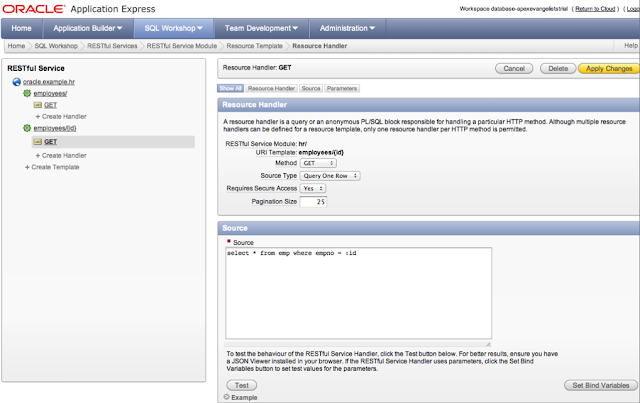 - Option 1 - The solution is to not reference the APEX 4.1.x swf files, but reference swf files that do work. You can for example download the latest AnyChart files and copy them on your webserver, preferable in a different path than the APEX /images/ folder. I encourage you to copy them in your own path and leave the APEX folder as it is. - Option 2 - As for some people it seems not trivial to do that, I created another solution by using the APEX Plugin mechanism. The plugin is basically a framework around the full AnyChart files. The only thing you have to do, is come up with a datasource (file, procedure, resource profile or REST service) that has the correct XML for the chart. You find the xml reference for AnyChart here. The APEX plugin is of type region, so once you installed the plugin in your application, the only thing you have to do is create a new region on your page. I included three region attributes in the plugin; the width and height you want the chart to be and the datasource (procedure name). As the datasource (procedure) gets called as an external process you need to make sure it has the correct grants. 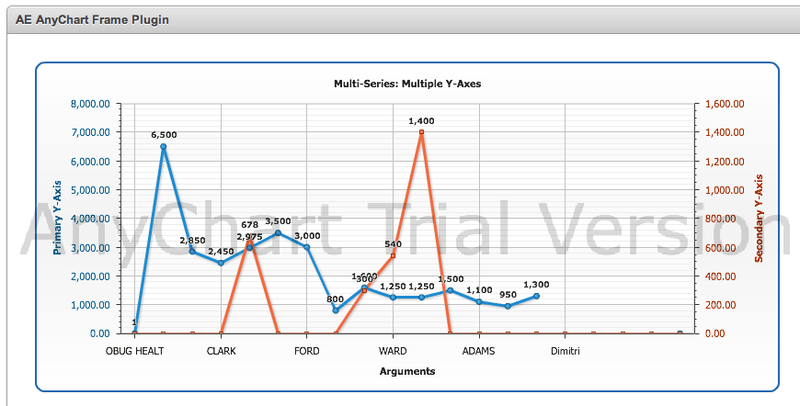 Note that I included a trial version of AnyChart, but you can easily replace that file. 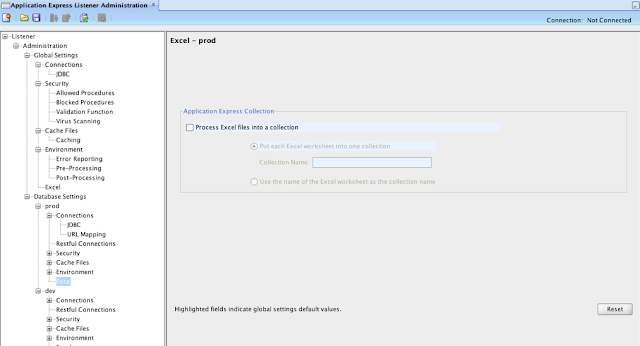 As APEX 4.2 is so close for production I also wanted to wait to see what files are distributed there, nevertheless I wanted to give you another solution to work around the issue in APEX 4.1.x. You can download the plugin here (which includes the procedure to generate the above chart). Once APEX 4.2 is live I plan to revise the entire chapter as things changed a lot, not only in the APEX 4.2 wizards, but also by the new HTML5 engine of AnyChart. Some of those plugins are payable, others we distribute for free, but we charge for support, upgrades, training and development of the charts you want. 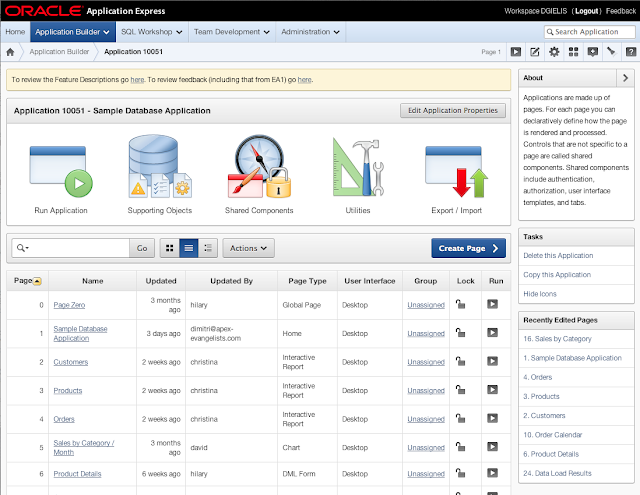 As the plugins are based on the AnyChart engine (which is not free), a lot will depend on what AnyChart provides to Oracle in APEX 4.2 if we can distribute the full AnyChart license with the plugins. Negotiating with AnyChart about a deal for the APEX community is postponed till after the APEX 4.2 release. After Uruguay and Argentina, the next country in the OTN Latinoamerica Tour (South leg) was Sao Poalo, Brazil. Just like the other countries it was also my first time here. I knew Brazil from the football and dance, but it surprised me in many ways. Already in the plane I couldn't believe my eyes... as far as I could see, I saw buildings, buildings and buildings! 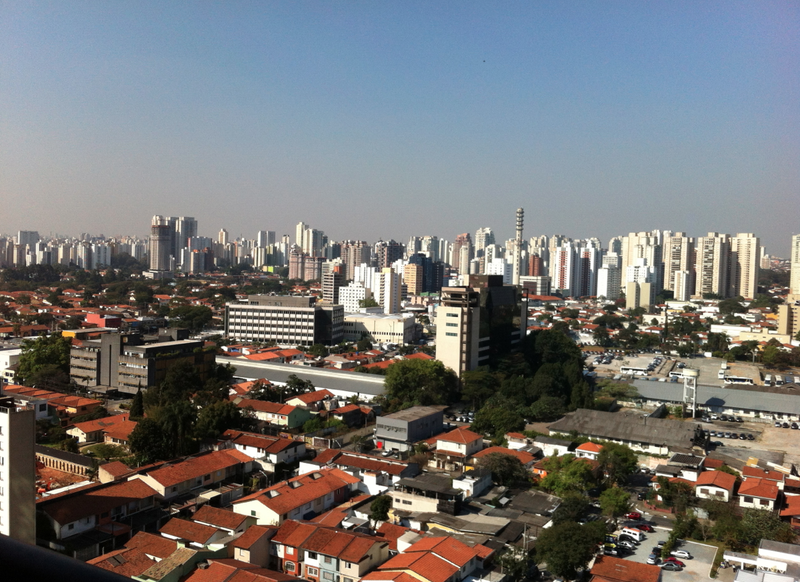 I didn't realize Sao Poalo was so big. There's a lot of contrast in new buildings vs older ones (or in other words between rich and poor). Now back to the conference. 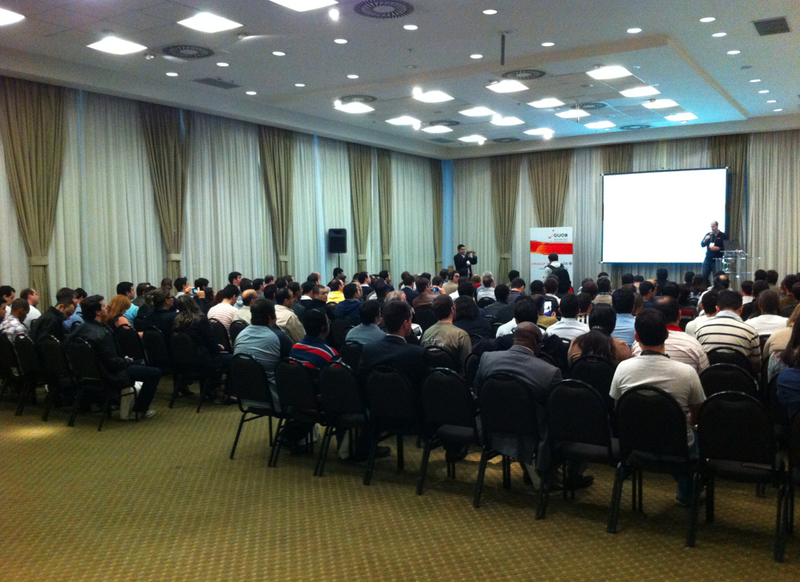 GUOB, the Oracle User Group in Brazil must be one of the biggest user groups in Latin-America. The conference itself went great I think. I met many new people and during my talks I got many questions, on and off topic, but all APEX related. Thanks again to the translators and the English speaking people, without them it would have been very hard for me to understand the Portuguese. It seems APEX in Brazil is starting to become popular, the people were definitely enthusiast about it. 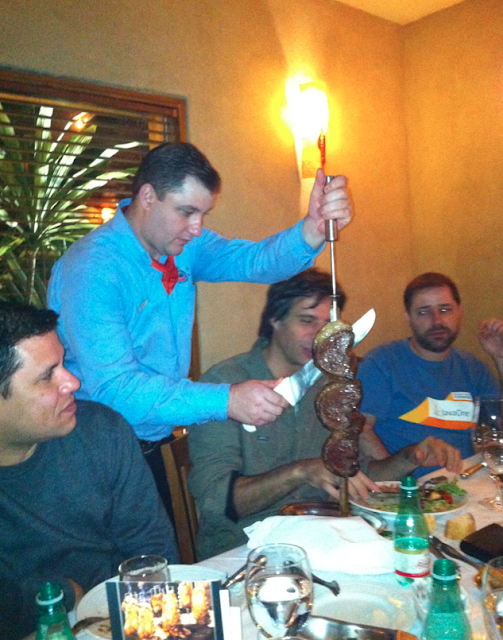 Here's a picture when they served Poalo from OTN. As I had some time between Brazil and my next stop in Lima, I tried to visit Mercado Municipal de São Paulo on Sunday, but because it was fathers day, it was closed. I did go to the Parque do Ibirapuera, which I enjoyed very much. Water, green, piece... and in the background you see the big building rising. Muito obrigado Eduardo, Patricia, Marcus and many others. Talking, spending time, having fun and dinner with other speakers is really nice. Unfortunately for some of the speakers Brazil was their last stop. Craig, Dana, Francisco, Tom, Graham, thanks so much! It will be different without you guys in the next countries. I truly enjoyed our time together. My next stop in the LA OTN Tour was Buenos Aires, Argentina. Just like Uruguay it was my first time here. 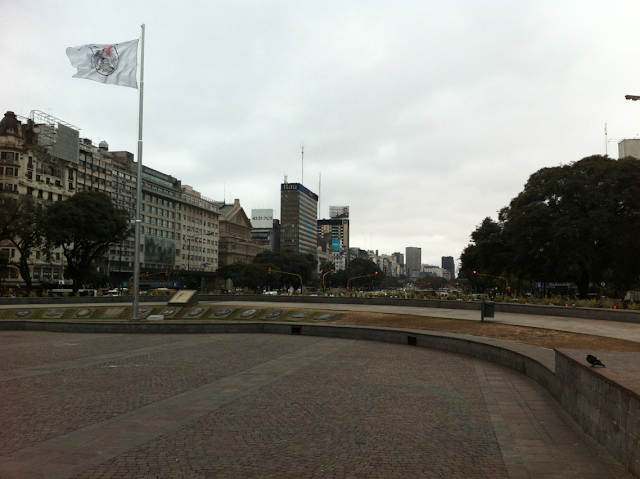 I found it very different from Uruguay... Buenos Aires is a big city, with many, many cars and huge drive ways. Here's a picture of the huge drive way. 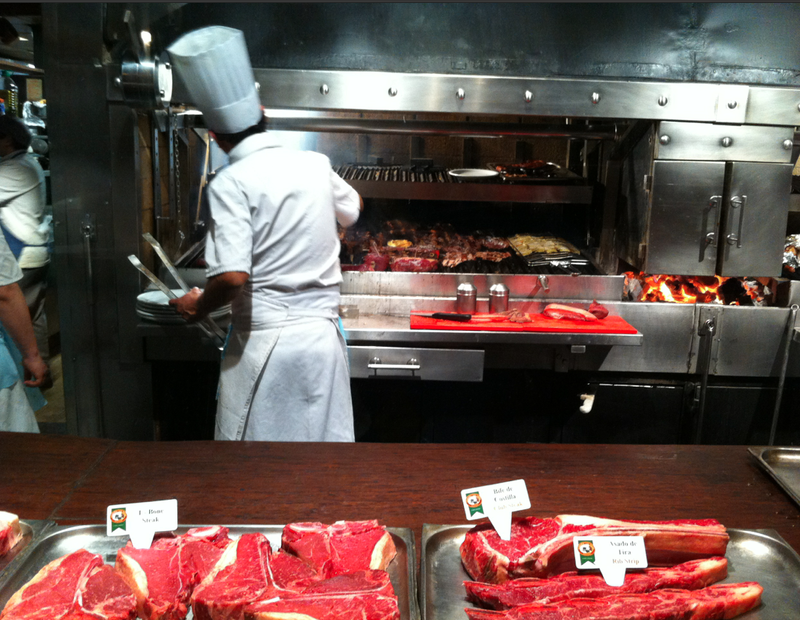 The day before the conference we went to a famous restaurant, Las Lilas. You can see from the picture where they were known for! I enjoyed it very much, definitely a place I would go back to. It was the first time the AROUG organised an Oracle event. Every start is difficult, but I believe the participants were very happy at the end. The Real Performance Tour and the LA OTN Tour presentations were at the same day, so the people had to pick. I had the opportunity to see a part of the Real Performance presentation by Andrew Holdsworth, Tom Kyte and Graham Wood. It's definitely something you have to see! Here's a picture just before the start. As you can see, they use three different screens: SQL*Plus and statistics on the left side, presentation in the middle and Enterprise Manager on the right. I was very interesting to see how the three presenters with their own expertise explained what was going on. These events are also interesting to meet new people. It was the first time I met Craig Shallahamer and decided to watch one of his presentations about the buffer cache. I was impressed at the way he explained such a "hard-core" topic. 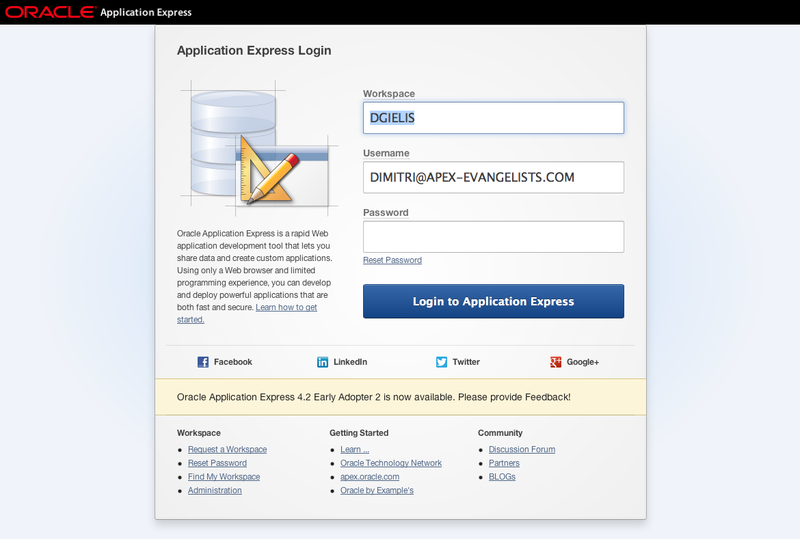 This is the start of a series of blog posts about APEX 4.2 (at the time of writing EA). APEX 4.2 looks completely different from any previous version of APEX. 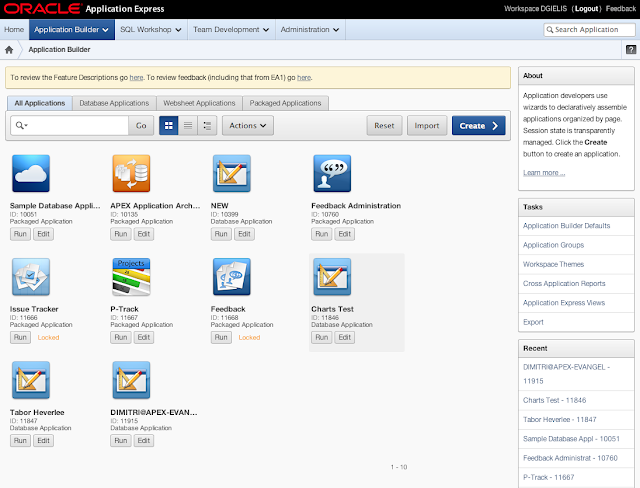 The Application Builder became a "real" 2012 web application. Behind the scenes a lot of HTML5 and CSS3 features are used, which gives the App Builder a fresh look and feel. It already starts when you login: the fonts and buttons are bigger and it's just crisper. The home screen shows new icons, hovering over them highlight the selection in blue so it's clear where you are. The Application Builder that shows the applications that you have in your workspace looks like this. 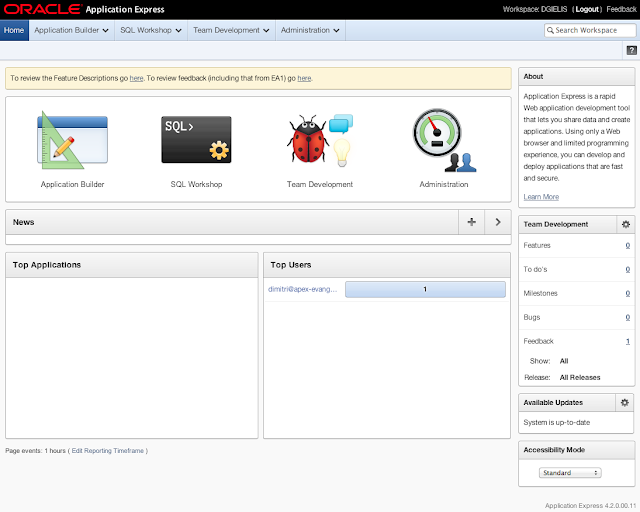 I'm unsure how you can change your own application to show another icon, but once Oracle allows to submit our own applications in the Packaged Applications section it will be possible I believe. The new theme of APEX itself is applied to all the wizards. The wizards are optimised, so you can get things done quicker than before and only relevant pieces are shown on the screen. For example, creating a new database application takes not more than 3 clicks and can include an home page by default now. The new Oracle APEX Listener 2.0 Early Adopter is publicly available now. If you compare it to the current production version these are the most changed or new features. 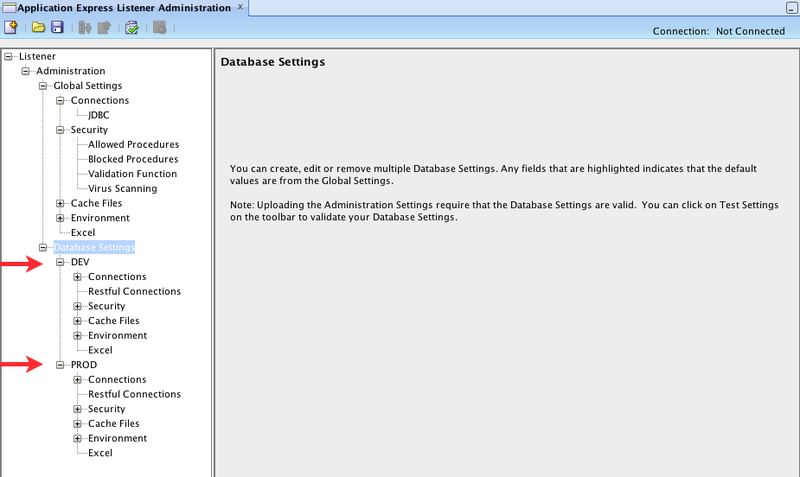 So the web interface is gone in the APEX Listener 2.x... As you can see in the screenshot, you can now configure multiple databases. 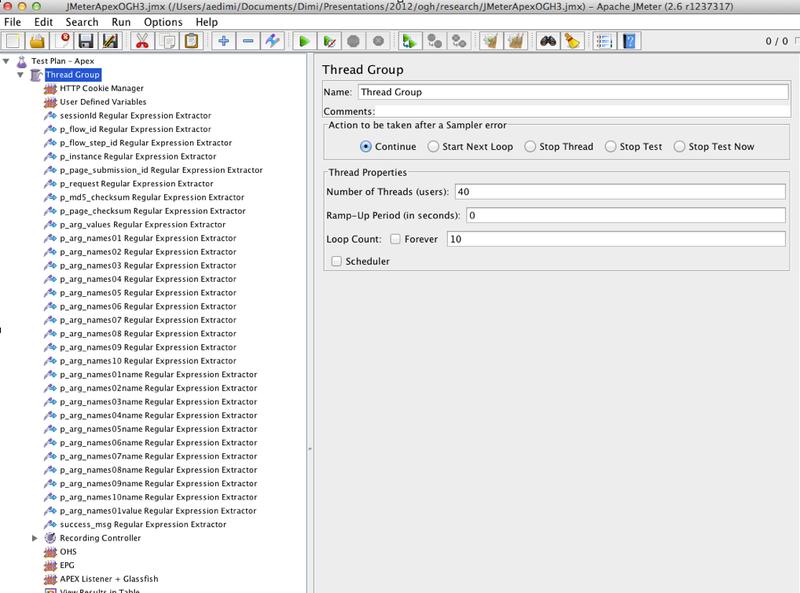 Before you had to configure multiple APEX Listeners; one for DEV, one for TEST, one for Production etc. Now you can just have one APEX Listener routing to the correct database. 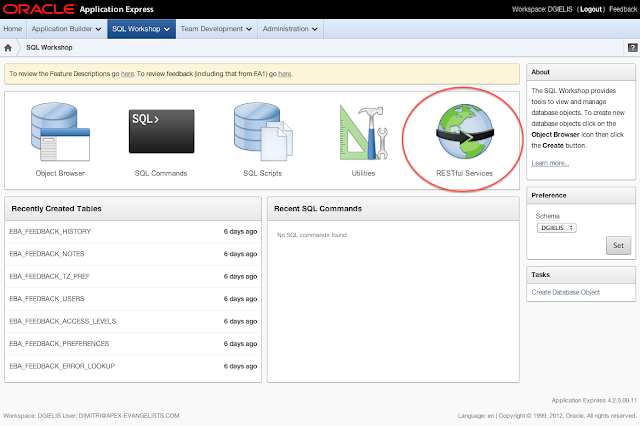 Another new feature is that you can route multiple url's to different APEX applications. 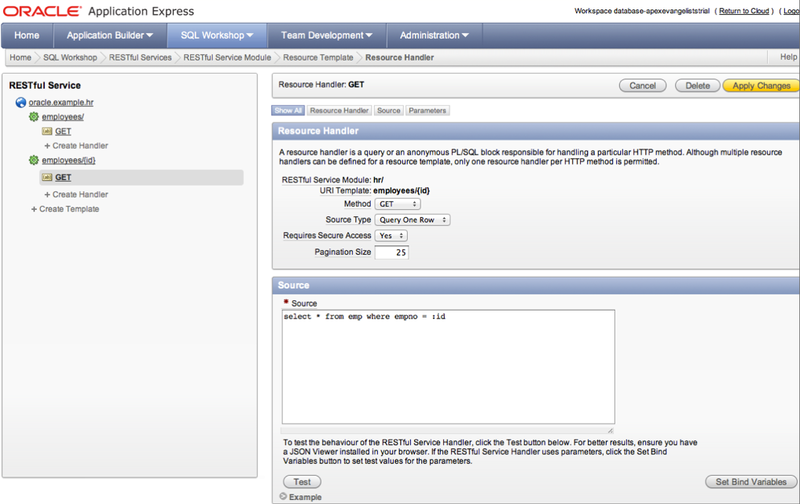 APEX Listener 2.x; you can now configure the RESTful Services through a patched APEX 4.1.1 or native in APEX 4.2. The following screenshot shows how it looks like in a patched APEX 4.1.1 version. 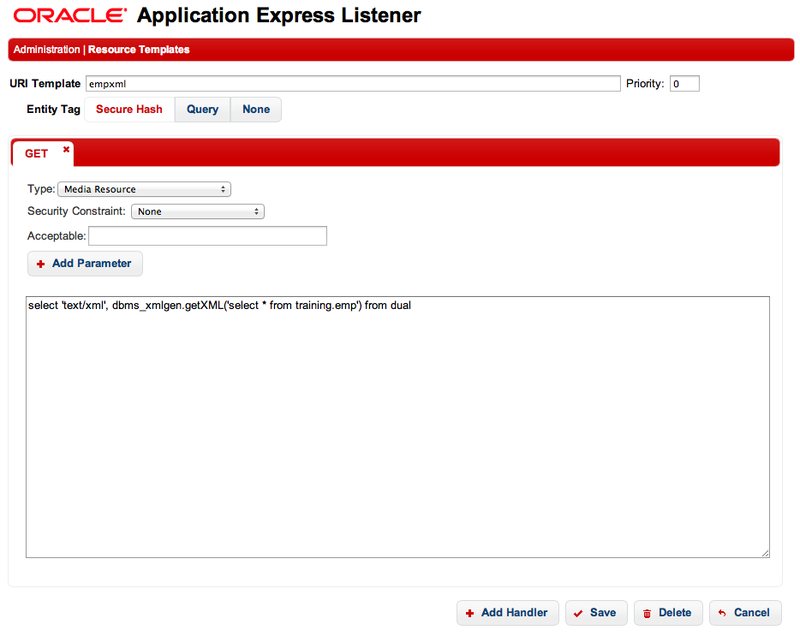 New in the APEX Listener 2.x is RESTful OAuth 2.0 integration. 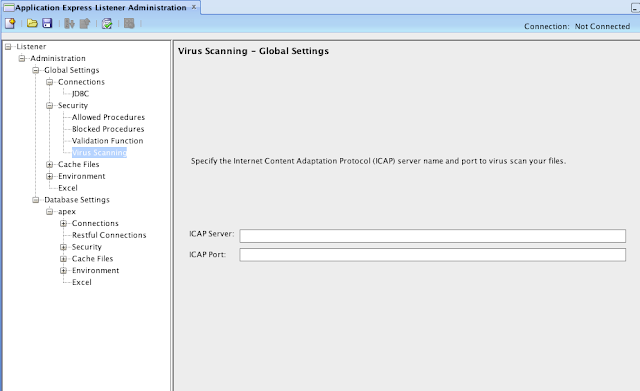 Integration of ICAP virus scanner, so when a file gets uploaded to your database, even before it hits your database it can be scanned. I hope you see that Oracle is putting a lot of effort in the APEX Listener... it fits in the proof of the additional features you get with the APEX Listener I mentioned in my previous post "Moving to the APEX Listener". 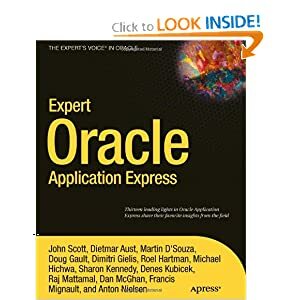 Are you already using the Oracle APEX Listener in front of Oracle Application Express (APEX) or are you still using Apache with mod_plsql as your webserver (or the EPG)? This year I started to give a presentation why I believe you should move to the APEX Listener. If you missed my presentation at OGh, ODTUG or UYOUG, I'll give this presentation again in Brazil and Santiago as part of the LA OTN Tour, at Oracle Open World (OOW) and at the UKOUG. In the presentation I go briefly over the pros and cons of Apache with mod_plsql, the Embedded PL/SQL Gateway (EPG), but spend most of the time on the APEX Listener (hence the title). After OOW I'll publish a whitepaper about this topic as well, so you can read it in full detail and have some test cases you can try in your environment. Nevertheless I already wanted to blog about some points of my presentation and whitepaper, especially in the light of APEX 4.2 and the upcoming 2.0 version of the APEX Listener. 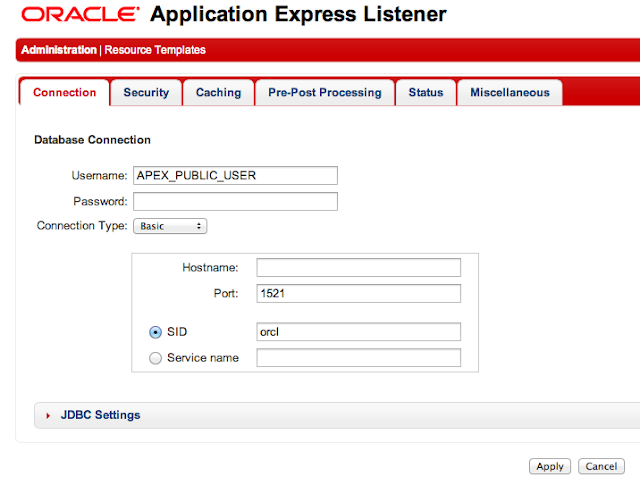 For the first point I can say we successfully run the APEX Listener now for 1,5 year in different environments. To name two; one environment is using Glassfish and the APEX Listener on top of Oracle Linux on the hardware of a customer and another one is running on our own server at Amazon, Oracle Linux and Glassfish with the APEX Listener with an Apache reverse proxy in front of it. Performance wise I show in my presentation and whitepaper how you can test your own configuration with JMeter, so you have real metrics. Depending the test case I ran on my system, I got different results, but in general the APEX Listener was as fast or faster than Apache with mod_plsql. Again you don't need to take my worth for granted, but test it out yourself in your environment by simulating your load with JMeter. How to do that you can read in my whitepaper or in this excellent post of Chris Muir (note that in APEX 4.1.1 you need to add some extra parameters to get it to work which are not described in the blog post). On the second point; the features of the APEX Listener compared to the other choices, I can be short. The APEX Listener will give you more features... even more interesting... if you are not using the APEX Listener from APEX 4.2 onwards, some functionalities for ex. RESTful Services won't work for you. At the moment APEX Listener 1.1.4 is the production version, but a few days ago APEX Listener 2.0 (EA) was released. You can read more about this release on Kris' blog. In my next post I will also highlight the biggest differences between APEX Listener 1.x and 2.x. Currently I'm doing the OTN Latinoamerica Tour 2012 (South leg). The first country we visited was Uruguay. It's currently winter here (whereas in Belgium it's summer), so the temperature is a bit lower (between 6-16 degrees Celsius), but it's still a lot warmer than the winter in Belgium! Here's a picture taken from my hotel room... nice indeed! 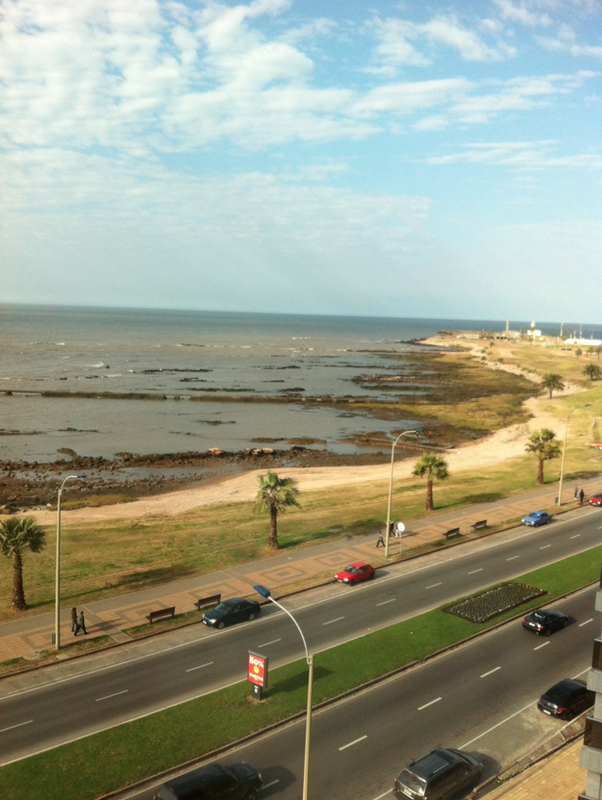 Uruguay has some really nice views and buildings. 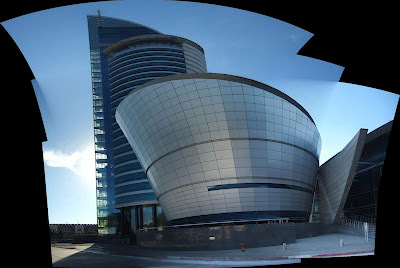 This is the building the conference is held in. The conference itself is very well organised. In Uruguay they speak Spanish, unfortunately a language I don't speak... but they did foresee translators, so real-time, people were translating during my presentation. Many people didn't need the headphones as they could understand English as well. I do hope to learn Spanish one day, as I like the language. There were many interesting presentations. As I was the only person speaking about APEX, it gave me the opportunity to see presentations about different topics. 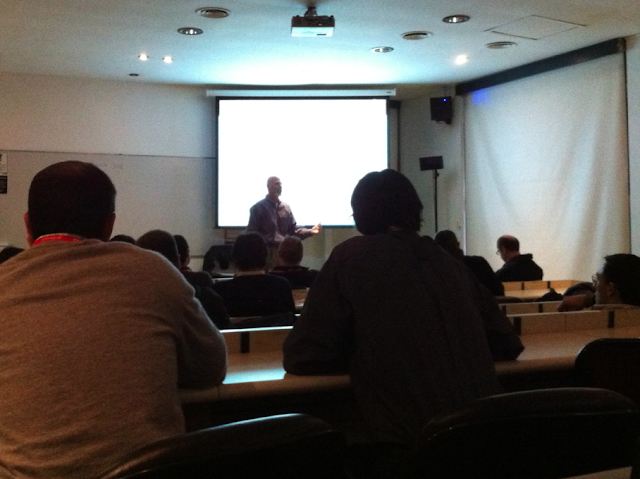 I enjoyed the presentation of Tom Kyte about Big Data and Dana Singleterry about "Is ADF simpler than Forms?". Big Data is obviously the next big thing, I look forward to integrate that with APEX. The demo's of Dana building ADF applications were interesting as well. 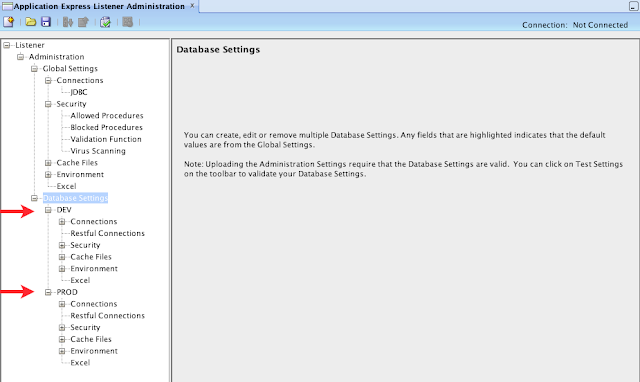 ADF has many build-in components (graphs, pivot, panels, ...) you can use out-of-the-box. 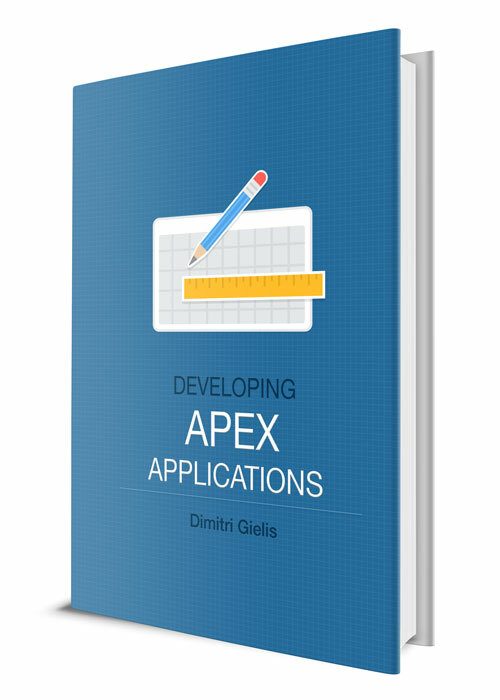 It was a while ago I saw an ADF presentation, and although I still find it a lot more complex than APEX, they made it a lot simpler and faster to build apps. In the evening we went out with the speakers to a typical bar/restaurant from Uruguay. I want to thank the organiser of the event so much, and special thanks to Edel, Daniel and Nelson. Muchas gracias! At the moment I'm on my way to Montevideo (Uruguay) for the first country in a row at the OTN Latinoamerica Tour 2012 (South leg). Francisco asked me already a few times, and finally this year I agreed visiting this part of the world. 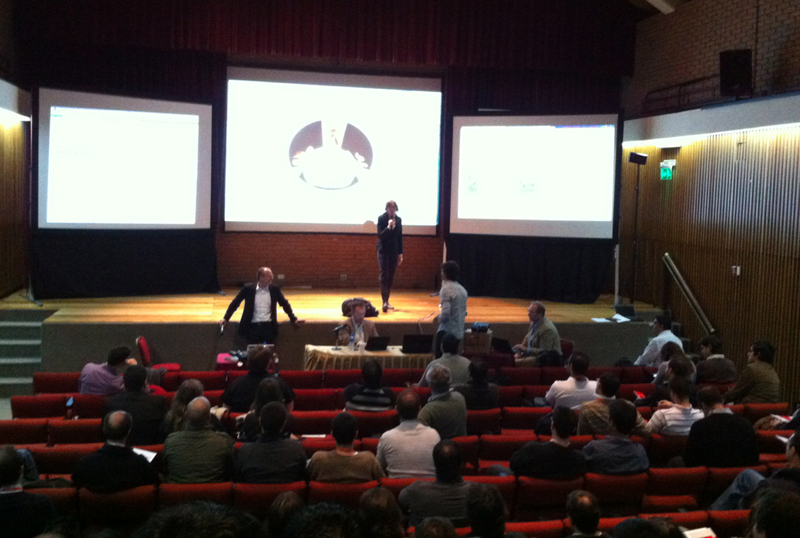 Already many thanks to Francisco and the whole team in Latin America for the invitation and the organisation. Reading Tim's post about the North leg, I'm sure it will be an amazing adventure for me as well, so I look forward starting this two week experience. I don't speak Spanish, but I do hope to meet and talk to many of you. Straight after KScope 12 I left on holiday, which meant I didn't find the time yet to get up-to-speed with blogging. Coming back a lot of work was waiting again and now I'm travelling again... I did want to finish this post first before getting onto other things. 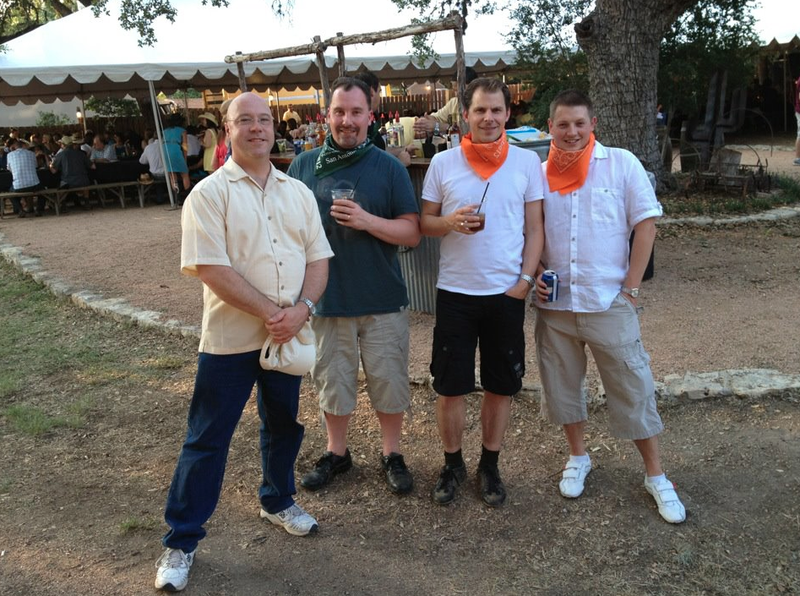 KScope 12 was another great conference. Next to the great sessions and meeting up with people, the APEX development team showed the power of APEX 4.2 on the Sunday symposium. If you didn't see APEX 4.2 yet, you can give it a try as the early adopter (v2) is ready to test. Although the 4.2 (instead of 4.1.1) doesn't sound like a big jump (in number), it is in my opinion. I'll come back to that in a series of posts about the APEX 4.2 version in the next weeks. Seeing a rodeo, people with booths, heads and guns... many horses, also amazing meat (dinner at the range). It was great to be somewhere I never went before. Here's a picture when somebody asked to have a picture with the AE team at the range where the rodeo was held. Update: Martin did an interview with me at KScope 12, where I give my view on the conference. You find it here. If you missed KScope 12 not to worry, next year there will be KScope 13. 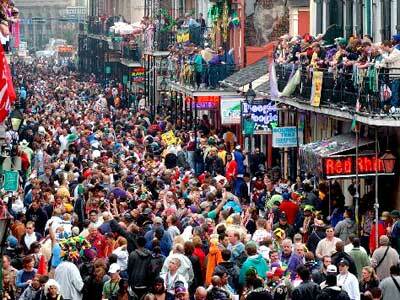 KScope 13 will bring us back to 2008, when the conference was held in New Orleans as well. We all have many memories about it! It seems that in 2008 I blogged a bit more in detail (every day!) about the events than nowadays. For example the Tuesday post you find here. One last thing I want to share, when you go to KScope 13, you should definitely try an "hand-granade"
I know already many people who were there in 2008, who already booked their ticket for 2013 (yes registration is already open)! 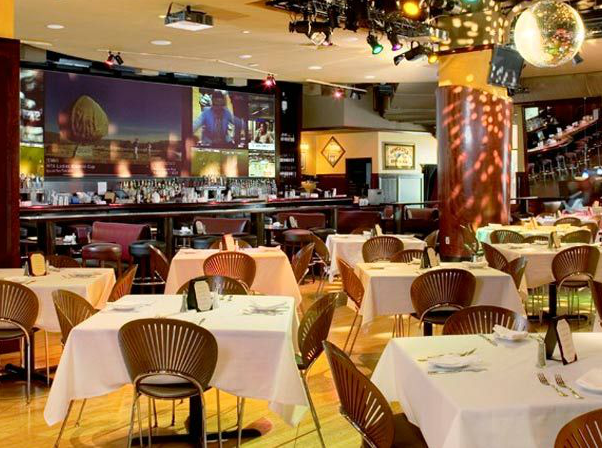 KScope 13 is definitely worth going to, not only for the great content, but as you can see above also for the social part. Many great people, very nice location... see you there.